The keys to the success of an enterprise such as the Treatise on Geophysics are the editors of the individual volumes and the authors who have contributed chapters. The editors are leaders in their fields of expertise, as distinguished a group of geophysicists as could be assembled on the planet. They know well the topics that had to be covered to achieve the breadth and depth required by the Treatise, and they know who were the best of their colleagues to write on each subject. The list of chapter authors is an impressive one, consisting of geophysicists who have made major contributions to their fields of study. 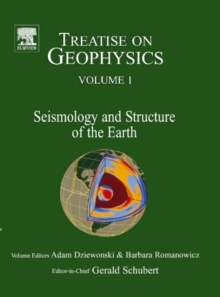 The quality and coverage achieved by this group of editors and authors has insured that the Treatise will be the definitive major reference work and textbook in geophysics. Each volume of the Treatise begins with an Overview chapter by the volume editor. The Overviews provide the editors' perspectives of their fields, views of the past, present, and future. They also summarize the contents of their volumes and discuss important topics not addressed elsewhere in the chapters. The Overview chapters are excellent introductions to their volumes. The volumes of the Treatise are: Volume 1: Seismology and Structure of the EarthVolume 2: Mineral PhysicsVolume 3: GeodesyVolume 4: Earthquake SeismologyVolume 5: GeomagnetismVolume 6: Crustal and Lithosphere DynamicsVolume 7: Mantle DynamicsVolume 8: Core DynamicsVolume 9: Evolution of the EarthVolume 10: Planets and Moons An eleventh volume of the Treatise provides a comprehensive index.